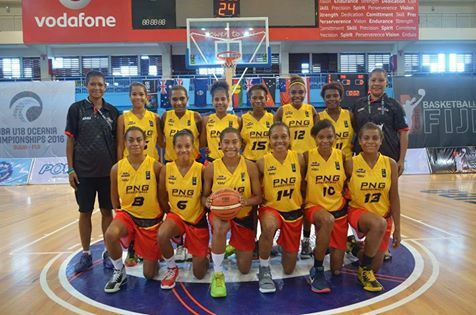 The Papua New Guinea Under 18 Women’s National Basketball Team have claimed the 2016 FIBA Oceania Championships Division-B Bronze Medal, following their 70-52 win against Guam this morning in Suva, Fiji. It was the ideal ending to what has been a challenging week for the women’s junior representative side. PNG showed tremendous character, but were winless throughout their Pool B preliminary matches, going down to New Caledonia (59-20), Guam (57-56) and New Zealand (121-13). The three losses resulted in the team moving into Division B and a semi-final matchup with host nation Fiji. While the girls battled valiantly, Fiji were too good securing a 70-42 victory. After showing improvement all week and with a medal on the line, PNG displayed their best performance in the rematch with Guam, running away to an 18-point win. while teammate Jennifer Haro also stood up in the team’s final game, compiling 13-points and a massive 23-rebounds. PNG Under 18 Women’s National Team Head Coach Mary Elavo was feeling proud after the team’s final game result. “Everybody contributed towards that win so it really feels great,” Coach Elavo said. fundamentals of the game to kids at a much younger age.” The PNG U18 Women’s National Team is scheduled to return into Jacksons International Airport, Port Moresby on Monday, December 12 at 12:10pm. (Air Niugini flight PX085).